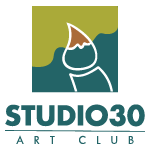 The Studio 30 Art Club was formed on January 26, 1981 in Victoria, B.C., Canada. Our name comes from the fact that the group originally was limited to 30 artists. Club members work in a variety of mediums including watercolour, acrylic, oil, colour pencil, ink and pastel. The group meets on the second Wednesday each month September through May. All club meetings take place at the Les Passmore Centre, 286 Hampton Road (near Tillicum Mall). Meetings start at 6:45 p.m. and end at 8:45 p.m.
New members are always welcome. Anyone who paints or draws and is interested in meeting other artists with similar interests is welcome to come as a guest and “try us out”. Please check our Membership Page for more details or Contact Us if you have any questions! We welcome individuals from all backgrounds to come interact with us and share our passion for art!